Bordeaux (France) as a region is split into three sections: Right Bank, Left Bank and Entre-Deux-Mers. Entre-Deux-Mers is 100% white wine from Sauvignon Blanc and Semillon. The Right Bank and the Left Bank produce comparable red wines, though very different due to the soil structure and warming abilities for the varietals grown (and allowed to be grown). soil consists of sand, clay and gravel with layers of limestone outside of Pomerol and iron rich clay (crasse de fer) in Pomerol. Left Bank Bordeaux wines are structured, tannic and expressive! the Médoc soil consists of gravel topsoil with Margaux showing increased layers of limestone, sand and clay and the Graves showing a sandier mixture with gravel and light clay is known as boulbenes. this gravely soil structure is vital for the maturation of Cabernet Sauvignon. Merlot, Cabernet Franc, Petit Verdot also play a role but are not primary. Two villages in Langhe Piedmont Italy– They always produce 100% Nebbiolo, however each area is a touch different. Therefore the expression of the grape is also unique. Barbaresco Langhe Piedmont — Barbarescos are feminine- rose petals, soft earth, with vivacious cherry expression! But don’t be fooled- this wine is still a gorgeous powerhouse. located south of the Tanzano river and north east of Barolo in the Langhe region. Though impacted by the cooling mists from the Alps, there is a mediating maritime factor for early ripening that allows for a riper and less tannic expression. region originates back to 1894 but popularity only arose in the 1950’s thanks to Gaja and Giacoso. Barolo Langhe Piedmont — Barolos are powerful- leather, musky pine forest earth, tobacco leaves, truffle, dried roses, and cured cherries! originally created as a sweet wine for nobility- the late 1800’s turned toward dryer wines. The highly tannic Barolo area Nebbiolo found success with aging. Tempranillo is an inky rich dark red varietal that excudes excellent ripe fruit and tannins, especially in hot areas. Rioja and Ribera del Duero Spain produce tempranillo as the main red varietal (with some exceptions). Historically 100% American oak, however modern techniques and the French influence (and oak) has been the shift! located on the Mesata plateau of the Castilla y León region. This area is surrounded by the Cantabrian Mountains with the Duero river passing west through to Portugal and the Atlantic ocean. flat and rocky terrain consists of layers of silty-clayey sand, limestone, marl and chalky concretions. minimum of 75% Tempranillo, with a maximum of Garnacha. Vega Sicilia placed this region on the map with a fresh new style in the late 1800’s, however it was the 1980s with investment in modern technology that released the popularity valve to the world. Over the last year, we have been writing on the various styles of beer. With the opening of our new shop, Jens was excited to expand the beer selection. And boy, did he! We have over 75 styles of imported and domestic beers. There is also a few ciders in there too! Compiled here are the educational and tasting notes. Enjoy!! Dry Irish Stout is most classic with a lighter body, lower carbonation and typically a nitro system for creamy testure. Bitter at times from roasted barely. Milk — Residual sugar (lactose) that is not fermentable by beer yeast. Sweet, rich and supposedly nutrious. Aromatic, yeasty, spicy and fruity- Belgian beers are so diverse in their flavor profiles. And rich! What would be better for a time a year that we delve into feasting with our family and friends?! 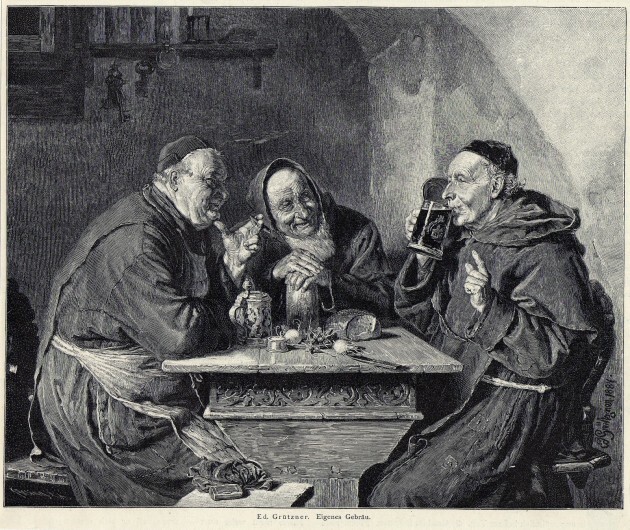 Dating back to the Crusades as a nutritious and “more sterile than water” alternative beverage, the abbeys utilized the funds collected to take care of their lands and monasteries. Abbey breweries have a bit more flexibility with the main clause that a portion of profits are under the abbey’s jurisdiction. It can be produced by a non-Trappist monastery or under commercial arrangement with monastery as well as just branded with either a defunct or made up abbey and produced by a a commercial brewer. Of course, these are all registered, and as of 2011 there are 18 Abbey beers produced. There are several styles of Belgian beers from golden to brown to saison to lambic and each one has a style of glass to go with it! The typical style is a tulip glass. Lambics and fruit beers are served in flute style vessels. Chalices and goblets are also common glasses- usually used with ales. La Chouffe Ale $4.99 | 11.2 fl oz — Golden hazy with yeasty and bready aromas, spices of clove, cinammon and coriander, fruits of apricot, banana, summer pears and lemon citrus. Huyghe Brewing– Delirium Trememns Strong Ale $7.89 | 11.2 fl oz — Golden color with earthy notes such as grass, banana, orange rind and anjou pears, cloves and wheat. Huyghe Brewing– Delirium Nocturnum $7.89 | 11.2 fl oz — Dark brown with red hues, fruits of raison, fig plums and baked apples, intriguing notes of brown sugar, tobacco leaf, earth and cocoa. Westmalle Trappist $6.89 | 11.2 fl oz — Dark brown with mahogny hints, layered fruit components of cherries, plums, raisons and sweet caramel fudge brownies; Notable hints of coffee, roasted malt and hazelnut as well. Corsendonk pater Dubbel $4.89 | 11.2 fl oz — Dark brown with ruby red tones, very subtle fruit for a Belgian- prunes, cooked cherries, raisons; distinctive notes of toasted malts and toffee. Chimay Premiere $12.99 | 25.4 fl oz — Dark brown with red hues, expressive fruits- raspberry, cherries, baked pears, plum with sweet notes such as fudge, caramel, toffee and brown sugar as well as rustic herbs and hops- tea leaves and yeast. Lagern means “to store” in German. Lagers are brewed with bottom fermenting yeast which works slowly at cold temperatures then is stored at cool temperature to mature. Lager yeast produces fewer by-product characteristics. International (OLD WORLD) vs American (NEW WORLD) Lagers are distinct as the yeast and hops are a different style. Old world hops and Saazer hops- spicy, herbal and earthy. American hops and new world hops- more fruit= berries, melon, grapes. Dortmunder aka DAB, Germany — Mild but bold. Balanced of malts and earthy grains with a light touch of hops. Clean and refreshing. Originally, founded in 1868 by the businessmen Laurenz Fischer and Heinrich and Friedrich Mauritz together with master brewer Heinrich Herberz, the name was Herberz & Co Brewery (Bierbrauerei Herberz & Co.) until it went public in 1881. NW Brewing Hawk One Pacific, WA — Grass and grainy sweetness. Pale and unobtrusive. OKOCIM or OK Beer, Poland — Sweet breadiness, corn and caramel. Pale golden goodness. Primator, Czech Republic — Fresh hay, malt, bedding straw, honey and biscuits. Staropramen, Czech Republic — Malt madness- skunky, herbaceous and bready. Zywiec, Poland — Corn, grains, honey, light citrus and malty notes. Simple. Originally a spin off of an American Pale ale, the American Amber ales have a high hop rate with a bit more body. Typically reddish with more floral hops aromas than an Irish red ales. Tasting notes: A balanced beer, with toasted malt characters and a light fruitiness, caramel/crystal malt flavor. Medium to high hop rate and aroma. Medium body. Light copper to brown in color. Moderate carbonation. Pike Brewing Heirloom Amber Ale Seattle, WA Balanced amber ale with biscuit malt and herbaceous hop character. IBU: 32 ABV: 5.00% $1.79 12 fl oz. 1989 and Charles and Rose Ann Finkel opened their own brewery in The Pike Place Market of Seattle. Having fallen in love with the many beers of Europe, they were inspired to bring back home a different style of beer. They also pioneered a beer & wine importing business. The golden hoppiness of the beer world under double rainbows of NW gladness… all began from Englishmen attempting to transport beer to and from India in the 1800’s. The beer of choice in those days was not pale ale but porters. But porters went flat or were consumed quickly by sailors. Solution: add some hops and increase the alcohol content! Here is a tidbit of our IPA selection in the coolers at Portalis. Reubens, Ballard WA IMPERIAL RYE IPA ABV: 8.4% IBU: 80+ Intense citrus and floral aroma followed by a smooth medium full mouth feel. Citrus leads the flavor profile, with rye spice and bitterness coming through in the finish. No Li, Spokane WA BORN & RAISED IPA 7% ABV IBU 85 Malt: 2-row, Crystal, Munich; Hops: Cascade, Columbus, Chinook, Northern Brewer, Cluster; Dry-Hopping: Columbus, Cascade Big, bold copper supportive body with citrus and piney flavors, a hint of mint. Fremont, Fremont WA INTERURBAN IPA, ABV: 6.2% IBU: 80 2-Row Pale, Munich, and Honey malts with Chinook, Centennial, and Amarillo hops. Roasted pale malt swirled with flavor malts and filled with the rich spices. Ninkasi, Eugene OR TRICERAHOPS ABV 8% IBU 100 Malts: 2-Row Pale , Munich, Carahell; Hops: Chinook, Cascade, Summit, Centennial, Palisade Double everything you already love in an IPA. Fiercely flavorful. Earthy, floral hop aroma and flavor with body and higher alcohol however the beer can be deceiving as it is very smooth. Wheat Beers are produced with up to 60% wheat instead of barley (German law requires at least 50%). Typically, they are cloudy and unfiltered. Witbier (Belgian – “white beer”) has flavors such as coriander and orange peel and are often made with raw unmalted wheat, as opposed to the malted wheat used in other varieties. Hoegaarden Original White Ale Brouwerij van Hoegaarden is an outstanding producer. When serving a bottled unfiltered wheat beer hold the glass on an angle and pour slowly. With about 10% or 15% left swirl smoothly to suspend the yeast, then add to improve the flavor, scent and appearance. Bavarian-style 500 ml, vase-shaped glasses. Berliner Weiße is often served in a schooner. Kristallweizen (especially in Austria and American) served with a slice of lemon or orange in the glass; this is generally frowned upon in Bavaria. Bavarian Monastery from the early 700’s lived through wars, earthquakes, the plague and industrialization. Classic clove spices, wheat nuances and nutmeg. Roasted meats, musky cheeses and sausage. Bananas, cloves, citrus, bread-yeast and velvety character. Clean finish. Enjoy on its own or with stew. Pilsner originates from the city of Plzen, Bohemia, Czech Republic, where it was first produced in 1842. The original Pilsner Urquell beer is still produced there. As a pale lager, it is fermented slow and cool, producing delicately flavored beers. Wild and zany, lambics are beers that ferment spontaneously in Belgium. That is, without brewers yeast, but with wild yeast strains such as Brettanomyces bruxellensis, Brettanomyces lambicus, Saccharomyces cerevisiae, Lactobacillus. Once the wort is produced, it is set out to cool in the open air so to meet up with the yeast in the environment. Typically done during the winter and spring months, as it is has a lengthily aging process and summer months are more apt to grow other organisms. Once fermentation begins, the lambic is then transferred to barrels (sherry or wine) and aged for one to several years. • Gueuze: mixture of one year-old and two year-old lambics, fermentation in bottle for a year. • Mars: no longer produced commercially, this lambic is a seconds off of an original brewing. • Faro: Brown sugar, caramel or molasses sweetened, this is a mixture of lambic and a lighter brewed beer. Sometimes fresh herbs are added. It is pasteurized to stop fermentation in the bottle.